Just read about this new feature for Yelp’s iPhone application. After relentlessly shaking my iPhone with no sign of the new feature, I deleted the App and then reinstalled it from the AppStore. After shaking 3 times, like magic, the new augmented reality feature was born. Follow these instructions if you have an iPhone 3Gs. Indoors it does not work so well, but the cool factor makes it well worth the install. Edit 9/7/09: Use this link to receive $25 free from Lending Club when you sign up. Microloans are all the rage now. With my “high-yield” savings account getting around 1.4% interest as of date, I needed something with a little more oomph. I had some success with Prosper (despite 2 of my 12 notes defaulting), and shortly after Prosper entered its “quiet period” I got into Lending Club. Transferring in funds in and out of Lending Club has proven to be relatively painless, and I plan to continue small investments to see how my strategy works. No defaults as of yet, but it is still early. My first defaults did not show up in Prosper for at least a few months. Anyone else have any success stories with Micro Loan sites? UPDATE 2/7/2013: Download Chrome Without a Web Browser. I recently came across an interesting tutorial on how to download FireFox using only the command prompt on Windows XP or Windows Vista, and I have made it a little more user friendly. This may come in handy in a variety of different situations, or it may just be used in an attempt to convince your friends that you are a hacker. In the quick tutorial below, please note that when I use quotes, it indicates exactly what you should type in, but do not type in the quotes themselves unless explicitly noted. 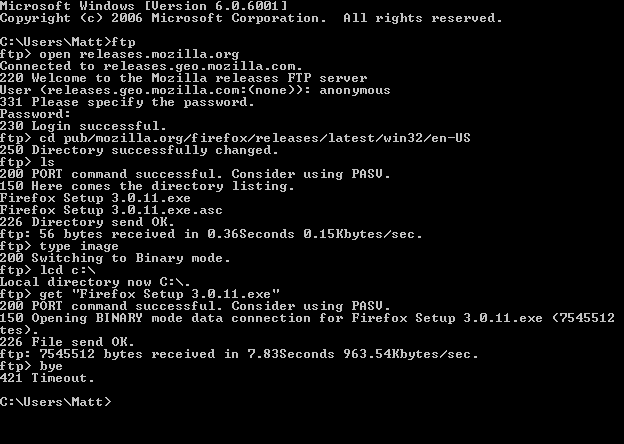 Go to Start > Run > “cmd” and hit OK. This will load the command prompt. type “ftp” and hit enter. type “open releases.mozilla.org” and hit enter. It will ask for a username, type “anonymous” and hit enter. It will then ask for a password, type “anonymous” and hit enter. “cd pub/mozilla.org/firefox/releases/latest/win32/en-US/” and then enter. View the contents of the current directory by typing in “ls” and then enter. Switch to binary file mode by typing in “type image” and then hit enter. Choose the directory to download firefox to by typing “lcd C:” (Typing this will save it right to the root directory of the C: Drive. Now go check in your c:/ drive, and you should see the .exe file downloaded. Type “bye” to exit the FTP mode, and then type “exit” to close out of the Command Prompt. Even with the new Google Gears Offline Gmail function in Google Labs, I still wanted to have a non-google-related backup of my Gmail account. 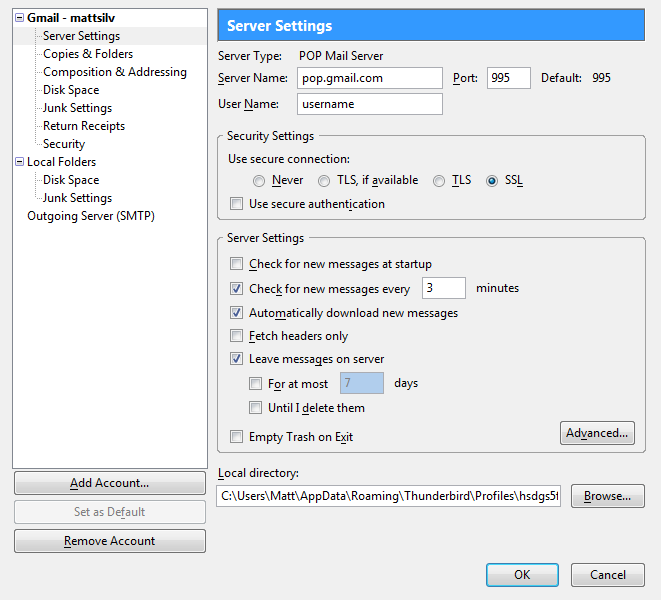 After researching the various options, I found that the easiest way to do so is to set up an old fashioned POP3 account in Mozilla Thunderbird, and let it sit and send/receive for a a few days. 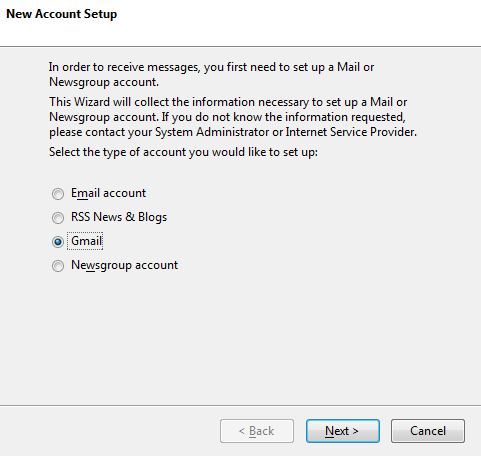 Thunderbird makes it sickeningly easy to set up Gmail, as it includes all of the POP3 Gmail set-up information. No need to worry about enabling SSL and TLS ports. Ready to get started? 1. Download Mozilla Thunderbird here. 3. Open Thunderbird, and close out of any Wizard that may open. 4. Go to Tools > Account Settings. Then click the “add account” button at the bottom right. 5. Select “Gmail” and hit next. 6. 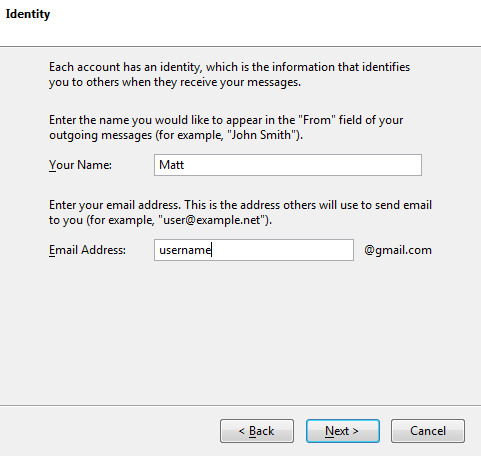 Type in your name, and the username of your GMail account, and hit Next. Hit Finish on the following screen. 7. You should not be back in the “Account Settings” Window. Click on “Server Settings” under your Gmail Account. Change “Check for new messages” from the default setting of 10 Minutes, to something shorter, like 3 minutes. 8. Hit OK, and you should be in the main inbox for Thunderbird. Now, hit “Get Mail” or use the shortcut CTRL-Shift-T to start your messages downloading from Gmail. 9. Messages download in batches of around 50 to 100 messages per time. For large inboxes, it may take several days to download all of your messages. 10. 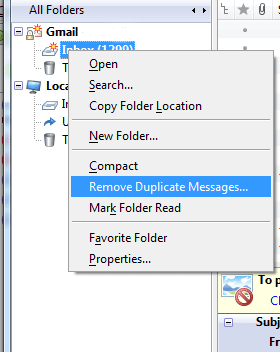 I noticed a lot of older duplicate messages in my inbox, so I downloaded the handy Remove Duplicate Messages Add-on for Thunderbird. 12. In the next window, all of your duplicate messages will pop up. All you need to press is the “Delete Selected” button, which will delete all of your duplicate messages, but leave the original ones intact. It’s been about 5 months since I started using Ooma. I must say that overall the service has been spectacular. While I still worry that they will be able to keep up their business model, I was reassured after talking to an Ooma tech who told me that a very large percentage of their customers opt-in for the paid monthly service. Despite setting up Quality of Service in my router, I occasionaly notice that the Ooma service gets fuzzy if I am running any network intensive applications including my Network Security Camera. I noticed that if I am watching the network camera while away from home, and if someone is using the Ooma phone while at home, the service can get a bit shoddy. This is not a problem for only Ooma, but any VOIP phone service. I still need to tinker with the QoS settings a little more to make sure that my router gives Ooma priority bandwidth. Even when downloading large files, Ooma does not seem to be affected, but with large upload activity from things like Bittorrent, and upstreaming of video, you may get different results. Ooma experienced a system-wide service interruption on April 13th, 2009. This happened to be on a day that I was implementing an Ooma system in a retail environment, and it caused some major headaches. The main problem was that Ooma did not make any kind of e-mail blast, or noticable announcement on the web site, so I only assumed that there was a problem locally with our network or Ooma hub. Since the outage, Ooma has implemented a number of corrective actions that will hopefully help not only alert us if an outage occurs, but prevent any future system-wide outages from occurring again. Especially nice is their new Ooma_Status Twitter account to keep you up to date on system issues. Very happy I did not go with Vonage and waste ~$25+ per month. No noticable quality difference between Ooma and a regular landline phone. It really beats talking on a cell phone too in terms of clarity. 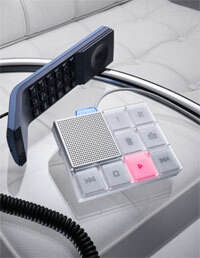 You can disable that weird Ooma chime that plays every time you pick up and place a call. Sign into the Ooma Lounge. Click on Preferences > System. 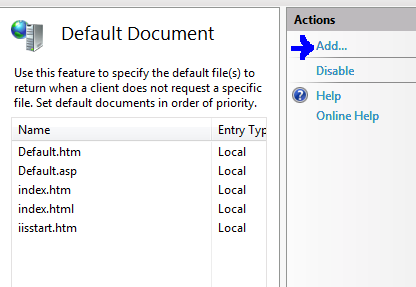 Then in the drop down box, select “(Disabled)” for Ooma connection tone. After about 3 minutes, your phone should have a regular dial tone, and no longer have the weird Ooma tune. Just a little shortcut. I happened to be using a locked down Windows Vista computer that would not let me access the “properties” of the My Computer icon. 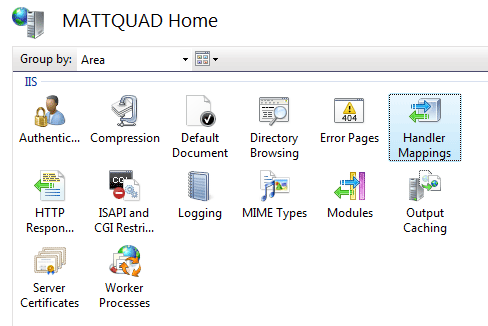 I needed to change the computer workgroup, and could not seem to get into it. I looked to see if there was a registry entry to edit for workgroup, but instead came up with this alternative. Update 8/23/09 Despite all of the hard work getting PHP installed on Windows Vista, I found a pre-configured WAMP stack that works great inVista Check out Server2Go! You can even install it right to a thumb drive. Update 8/14/09 – After finding many limitations in ultimately successful set-up of LAMP on Windows Vista, I caved in and set up a Linux server for under $200. After all is said and done, this proved to be a much better, and seamless solution to having a local production environment. These instructions were adapted from a nice tutorial found at iis.net. 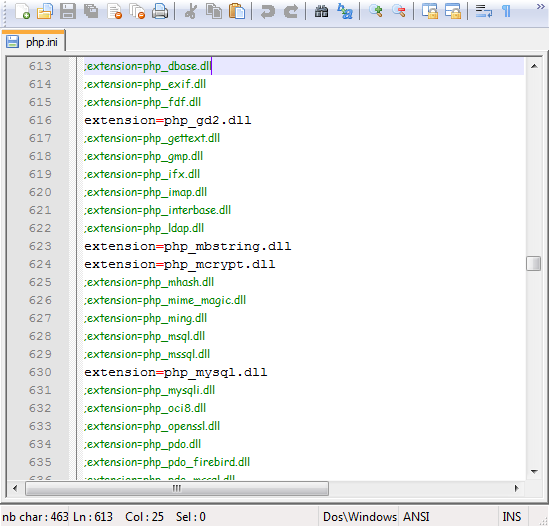 I recommend the text editor Notepad++ for editing config files. 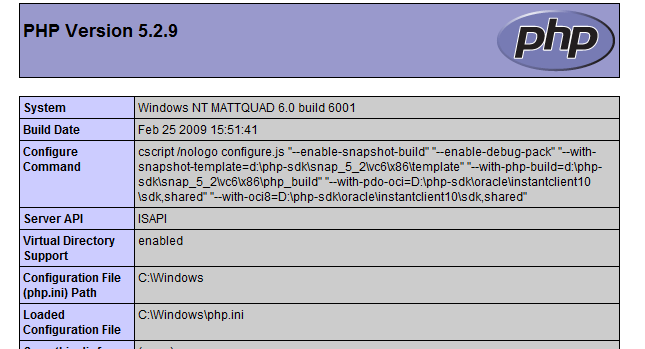 If you are like me, you may have remnants of unsuccessful PHP/MySQL attempts installed on your Vista machine. In order to be successful in this installation, you must uninstall any previous installations of PHP, MySQL, XAMPP, WAMP, etc. Download the latest PHP .zip package for Windows. 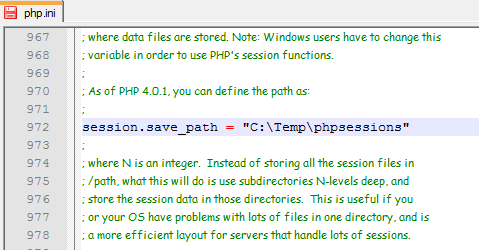 Create a folder named php on your c:drive, and extract the zip file there. The path will be c:/php. After the files have unzipped, open the c:phpphp.ini-dist file in Notepad++, then hit file, save as, and save a copy of the file to the c:windows folder, naming it php.ini. 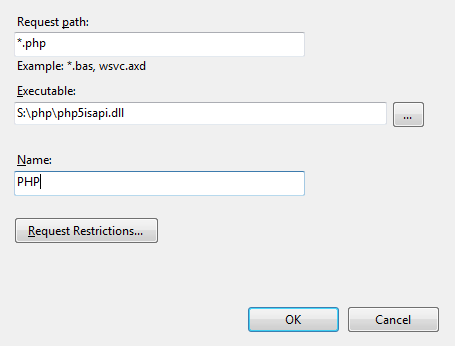 Now, map *.php to your php5asapi.dll file which you most likely extracted to c:/php. If you see the standard PHP info page, then you can take a sign of relief, as PHP is now successfully installed on your Windows Vista machine. Now it’s time to make a few more tweaks. Type “index.php” and hit OK.
Ok, final final step. Go to the folder you originally unzipped PHP to, copy the libmcrypt.dll and libmysql.dll and paste them to your c:/windows directory. This will be necessary later when we install MySQL. Your all set for PHP. Stay tuned.. I will update this page with a link to the Installing MySQL on Windows Vista next. Working on posting all of the 2009 Super Bowl Commercials to BestViral. If you try to open a new spreadsheet from the file menu in excel, it just overlaps your current view. The side by side view is not much help either, even with two displays. To open up a completely separate Microsoft Excel Window, simply have one excel sheet open, then go to the Start Menu and open up Microsoft Excel again. 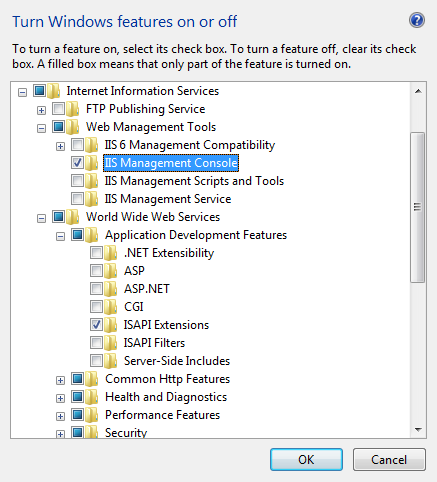 This will run another completely independent instance of the program.